GRADE:Disc is in VG+ condition. Scattered light scuffs & hairline scratches, some backround crackles/pops but nothing bad, no deep scratches, music plays loud/clear. COVER:(EX)Cover is a Record Company sample cover, split open with record company information written on inside of fold-out cover. 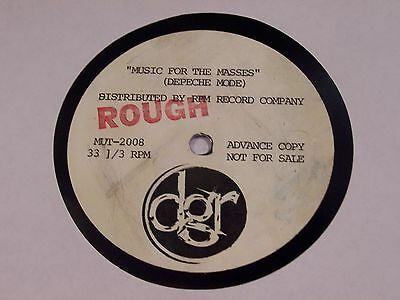 Comments:This is a 12" Acetate (full album) by Depeche Mode from south Africa, 1987, with full picture cover. PLEASE READ THIS BEFORE YOU BID !! UNDERSTAND THAT WE WORK VERY VERY HARD TO ENSURE RECORDS ARE GRADED ACCURATELY, PACKED SECURELY/SAFELY IN A STRONG BOX, SHIPPING IS 1-2 DAYS, SHIPPING CHEAPER THAN MOST DEALERS, OUR COMMUNICATION IS STRONG & OUR SERVICE EXCELLENT AND THE BEST THAT IT CAN BE. WE DO NOT DEMAND NOR EXPECT FEEDBACK COS WE KNOW YOU ARE BUSY, BUT IF YOU GONNA GIVE IT, THEN PLEASE MAKE IT TASTE GOOD !! I have recently purchased a rather large record collection of various USA & Import (1950's-1980's) Lp's, 7", 10", cassette & 8-Track tapes, music books & magazines from an older music industry radio person. Myself being a music fan & part-time collector over the years, I appreciate the value of some of these items to music fans & collectors worldwide. Obviously I cannot keep everything and so have recruited the services of an experienced long time record collector/dealer/ex-store-owner to help me with the grading & evaluation of these items for my Ebay store. I have named this store HAPPY DAY RECORDS for a good reason!! I know from some of my own purchases in the past, that records are often inaccurately graded or incompletely described regarding other defects and often poorly packaged....I aim to ensure that this NEVER happens to any customer of mine. I also know from my previous purchases, how veryhappyI was when I received a record that had been carefully packaged, shipped quickly and was in the exact condition described. So it is my absolute sincere aim to provide that sameHappyfeeling to each & every customer of my store through excellent service. Each item listed will be accurately graded so you'll know exactly what you're getting. Of course I am always looking to improve the quality of service and so would appreciate any suggestions or comments from you, a valued customer. LP Only Shipments: $8for the 1st LP+$1.50for each additional LP. 45 Only Shipments: $5.00for the 1st 45+$0.75for each additional 45. Mixed Shipments: $8for the 1st LP+$1.50for each additional LP /$0.75for each 45. LP Only Shipments: $5for the 1st LP+$1for each additional LP. 45 Only Shipments: $4.00for the 1st 45+$0.50for each additional 45. Mixed Shipments: $5for the 1st LP+$1for each additional LP /$0.50for each 45. LP Only Shipments: $14for the 1st LP+$5for each additional LP. 45 Only Shipments: $10.00for the 1st 45+$1.50for each additional 45. Mixed Shipments: $14for the 1st LP+$5for each additional LP /$1.50for each 45. Double LPs, box sets, etc. will have appropriate additional shipping costs. 1)For high value records (or a record that is much desired by you), IF YOU NEED A UNIQUE TRACKING #,REGISTERED MAILorINTERNATIONAL PRIORITYEXPRESS MAIL via U.S. POST OFFICEIS RECOMMENDED !! 2)Delivery Confirmation and insurance is not available for items leaving USAunless parcel is sent viaREGISTERED MAIL = $15 fee. 3)Items will ship within the next 1-2 business days after payment made to Paypal (always takes longer if payment via aPaypal Check). We will notify you immediately if there is a delay in shipment of your parcel. Unless shown otherwise, every record is an original issue for the label and catalog number given. Here is a brief explanation of my grading system. Iuse a modification of the Goldmine Magazine standard grading system. That means that there's a grade between NM and VG+ = EX. Imay also,in some cases, add an extra + or extra - to a grade ifI feel it necessary. VG+ Has a small visible flaw. VG Has multiple small flaws. All flaws, such as ringwear, creasing, stickers, tears, handwriting, sticker removal damage, punch holes, saw-cuts etc, will be noted in the description part of the listing. FACTORY SEALEDBrand new, never opened, perfect in every way. NM (near mint) Opened, may be played or unplayed, no visible flaws. EX (Excellent) Played, but sparingly, vinyl is still very shiny,may have a few sleeve scuffs. VG+ (Very Good +) Played, but well taken care of, may have light scuff marks,light hairline scratches. Still shiny. VG (Very Good) Very played, will have minor scratches which will probably be audible. G (Good) Will play through but with substantial deterioration of the sound. We won't waste your time by listing any UNLESS, the record is extremely rare. You, being a collector are surely aware that in some cases, old thick vinyl can appear visually scratched up, but sound a lot better than it looks when played ....I will make a note of this in the description if it occurs. Labels will not be graded, but defects like handwriting, sticker damage etc will be noted in description. COMMENTSDetails of various special features and/or all defects will be accurately described in the "DESCRIPTION" section for each listing. Please understand that it is not humanly possible to play-grade hundreds of items at a time. Unless otherwise noted, all records are GRADED VISUALLY, however, if you request it, I will gladly have the record PLAY GRADED. Acceptable forms of payment include:Paypal or Credit Card via Paypal.Payment must be received within 4 days of Auction Close. If you need more time, please notify us.Please bid responsibly. COMBINED PURCHASES :Please wait for an invoice with combined shipping total before paying for the items.Payment must be made viaPaypal. response, please use the ebay messages system. All communication will be answered AS SOON AS POSSIBLE. Returns:If I have made an error in the listing I will always work with you to correct the problem. Of course, if you are not entirely satisfied with your purchase, I will offer you a full, money-back guarantee refund, (including full refund on all your shipping costs) no questions asked. Item must be returned or shipped within 7 days of your notification to us that you are not satisfied.